Stickers and patches with a teddy bear theme. In general, these are iron-on patches to be used in children's clothing. For more information, read the description of each product. Sticker (patch) with an embroidery of a smiling teddy bear with a little pink flower.Content: 1 iron-on sticker.Dimensions: approx. 42 x 65 mmMaterial: Textile. Sticker (patch) with an embroidery of a little bear in many colors. Dimensions: approx. 55 x 60 mm Content: 1 iron-on sticker. Material: Textile. 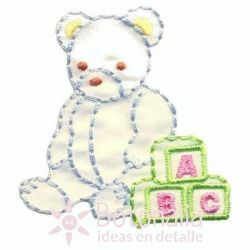 Sticker (patch) with an embroidery of a baby bear sleeping in pastel colors. Dimensions: approx. 50 x 70 mm Content: 1 iron-on sticker. Material: Textile. Little bear in pastel colors. 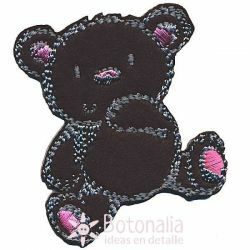 Product Description: Sticker (patch) with an embroidery of a small bear in pastel colors.Dimensions: 48x50 mmContent: 1 iron-on stickers.Material: Textile. Product Description: Sticker with a design of a bear with a bird.Content: 1 iron-on sticker.Maximum Length: 65 mm.Material: Textile. Product Description: Sticker with a design of a black bear.Content: 1 iron-on sticker.Maximum Length: 65 mm.Material: Textile. 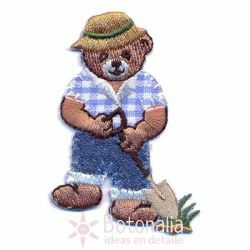 Product Description: Sticker with a design of a bear working in a garden. Content: 1 iron-on sticker . Maximum Length: 64 mm. Material: Textile. Product Description: Sticker with a design of a bear.Content: 1 iron-on sticker .Maximum Length: 60 mm.Material: Textile. Product Description: Sticker with a design of a baby bear.Content: 1 iron-on sticker .Maximum Length: 33 mm.Material: Textile.